« Conference on Orgonomy/Contact With Space, 17-18 June, Athens Greece. 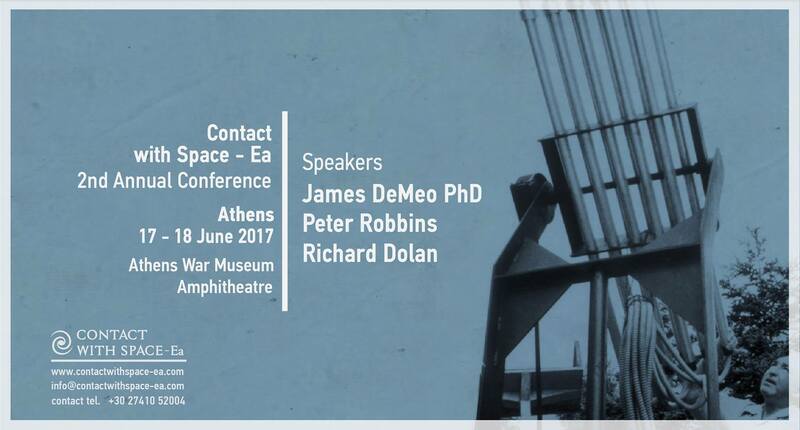 Conference on Orgonomy/Contact With Space, 17-18 June, Athens Greece. This Conference is very interesting and one of the first I know that devotes significant attention to Dr. Wilhelm Reich’s most controversial last works, on the subjects of the UFO and gravitation. I’ve been invited to present on my own experimental work over many decades, investigating and confirming Reich’s findings. I’ll give a lecture on my Saharasia confirmations, another on my laboratory confirmations on the orgone accumulator and various orgone-energetic anomalies and phenomena, a third lecture on my successful cloudbusting expeditions to end severe droughts and green deserts, and for the first time, a fourth lecture discussing my own UFO observations and related inquiries over the years. 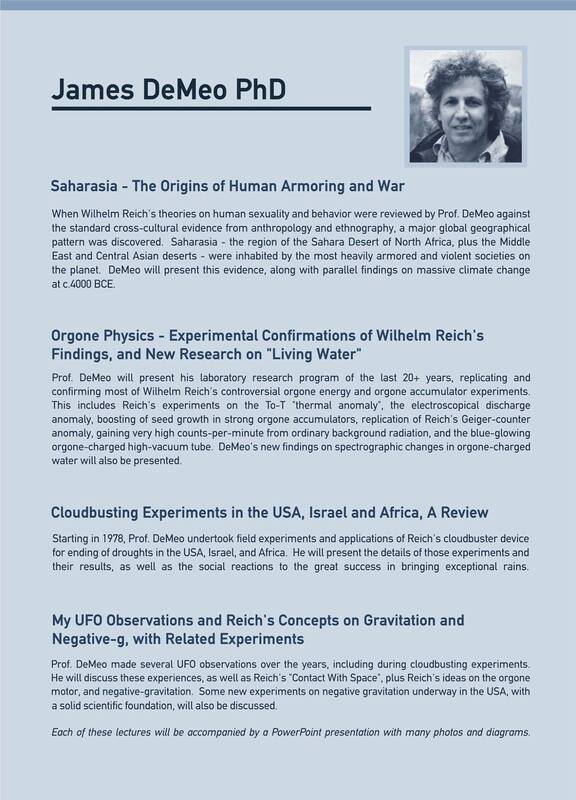 I’ll also give my insights into Reich’s last work in orgone physics, his post-Oranur Experiment investigations. In that work, Reich personally witnessed UFO fly-bys during his cloudbusting projects (something I also once witnessed and wrote about, in the publication Heretic’s Notebook*). Reich speculated the UFO used orgone energy as a means of propulsion, touching on the subject of gravitation and possible negative-g. Regarding the other two presenters, I know Mr. Peter Robbins and his exceptional research into the UFO phenomenon since many years, and always found his lectures to be insightful and illuminating. He is one of the most serious and empirically-oriented UFO investigators I know, and has done much in the way of separating out fact from fantasy or fiction in this fluid field of study. His articles and lectures on Reich’s UFO observations have provided confirming evidence from other credible witnesses for nearly everything Reich wrote on the subject, and is the de-facto top expert in orgonomy on this subject. 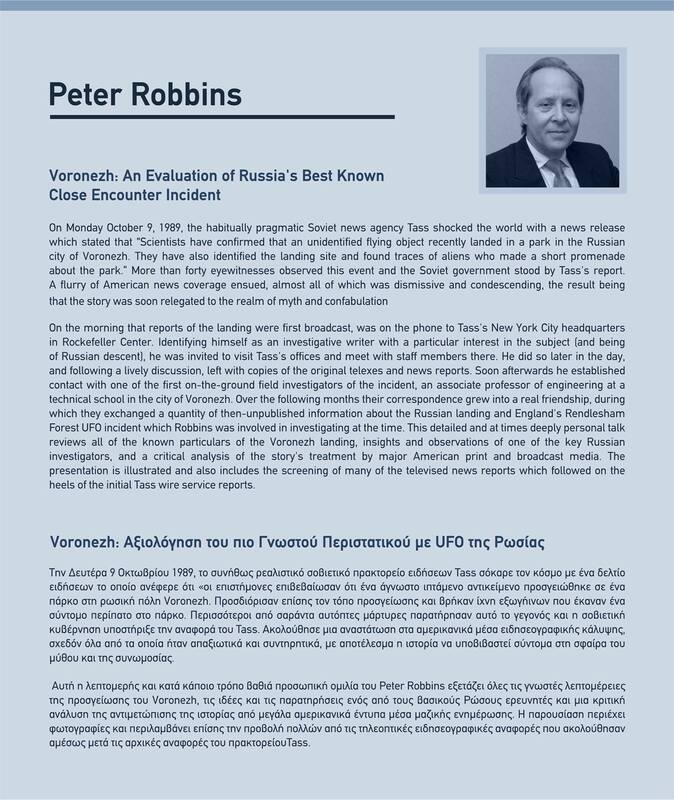 Robbins has also written books and articles on many key-critical UFO events in both the UK and USA, and at this Conference will tackle yet another critical case study, from the old Soviet Union. 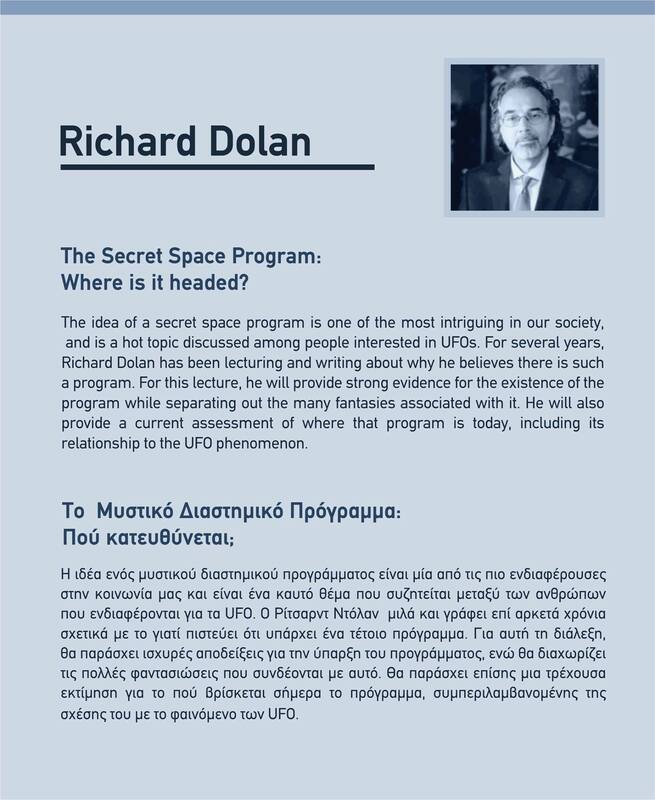 Mr. Richard Dolan I have not met, but his talk on possible government programs for UFO or anti-gravity propulsion research is timely, and should be very interesting. I look forward to this event. Plan to attend if you are able. * "My UFO Observations", in Heretic’s Notebook, 2002. This entry was posted on May 28, 2017 at 7:51 AM and is filed under Uncategorized. You can follow any responses to this entry through the RSS 2.0 feed. You can leave a response, or trackback from your own site.